One day, there was a telegram ordering me to rejoin my crew and prepare for operational duty. This was it! The summons at last. So we arrived at Finmere and found we were to fly Mitchell’s- B-25s. The B-25 would be able to park under the wing of a modern jet and be dwarfed by it, but in 1944 it was a workmanlike, formidable plane taht had remarkable versatility. A couple of years earlier a squadron of B-25s had taken off from a US carrier and had bombed Tokyo. 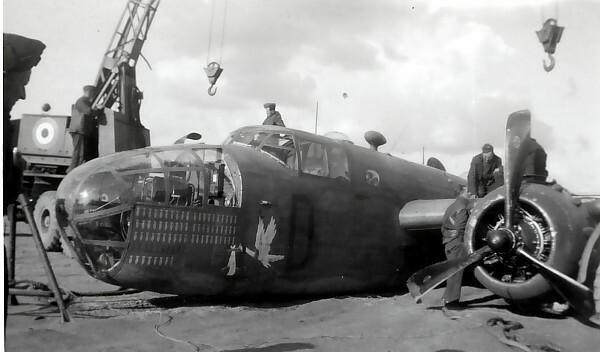 It carried 2 tons of bombs, twin guns in the turret, one in the nose. B-25s had even been modified to fire a 75111m cannon- the recoil must have dropped airspeed by 30 knots or more. It was a sturdy, forgiving machine, and we grew attached to it. When we climbed aboard for the first familiarisation flight and started up the huge motors, we realised that we were finally committed, that in a few wee we would be on the battle order. We also quickly learned that flying over England was a very different proposition from flying over Canada. There were differences of terrain, restricted areas, weather- dozens of new regulations and cautions. Also, we now had rudimentary radar navigation equipment to master, a more complex and powerful aircraft to fly, and most of all, the thousand and one details of squadron operations, emergency and ditching drill, radio codes and identification, escape procedures if shot down over enemey territory- an encyclopaedia of vitally important information. In addition, it was obvious to everyone that the invasion of Europe was imminent, and we were all waiting for the big show to begin. In a very few brief weeks we were transferred onto the strength of 180 Squadro 2nd. Tactical Air Force at Dunsfold in Surrey, just South of Guildford. 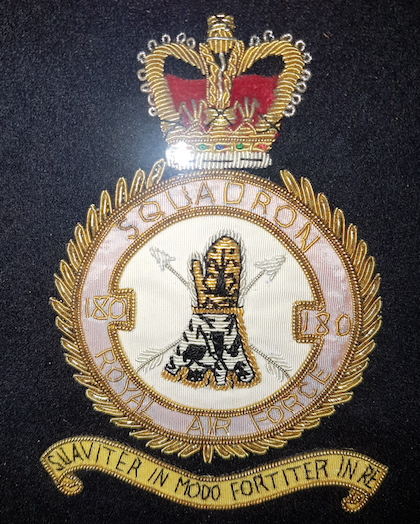 We were one of three squadrons on the field- 98 squadron RAF and 322 squadron Royal Dutch Naval Service, were the others. Our first commander was wounded shortly after we arrived, and Major Gronmark of the Royal Norwegian Air Force took over- a huge bear of a man, whose only objective was to get the war over as swiftly as possible and return to Norway. He didn’t much care what we got up to outside of our missions, but he was an exacting commander once we were airborne. The Invasion was now nearly upon us. The 2nd TAF had been attacking targets in the Pas de Calais area of France- railway yards, bridges etc- both for the target itself and as part of the attempt (succesful, as it turned out) to draw attention from the intended landing in Normandy. Once June 6th arrived and the landings had taken place, we were switched to Army support in Normandy and further afield as the troops pushed inland. We attacked Panzer Groups, bridges, ammunition dumps, trains, troop concentrations- all tactical battlefield targets. We were often sent up at short notice to respond to a report by the French Resistance who would send word that X Division of the German Army would be in trains at a certain location between 1300 and 1400 hours, and would we kindly provide a welcome for them. So it was an interesting time. I could probably still draw a reasonably accurate map of Northern France with many of our targets- St. Malo, Cherbourg, Alewon, St. Lo, Fontainebleau, Brest, Sainte Mere Eglise, Argentan, Caen – come off the top of my head as being some of the places we visited. St. Lo was reduced to rubble, and we could always locate ourselves by reference to the off-white blotch on the countryside that was all that remained of St. La. Caen we visited several time always to a spirited reception by the other side – that was where my old friend Johann Hoffman was firing his 88mm gun at us. Once over Caen, a perfectly lobbed shell burst two of our formation, bringing both of them down. Some trips we would sail in and out with only a modest amount of flak, and no damage to any of us. Other days it would be a wretched slog from the moment we crossed the French coast. Fortunately we had not too much confrontation with fighters. Up came the flak like a Christmas tree. Who’ll come on ops in a Wimpey with me. Since we were a Tactical Group, we were required to be able to move to another field within 24 hours. Consequently we all lived in tents, had field kitchens, mess tents etc, and very little segregation of officers and other ranks. I enjoyed it. Like being at a super boy scout camp, and even being paid extra for living in tents. The Battle Order was posted on a board in the middle of the aircrew tent area, and in its settin , it was almost like the cricket team listing on the school notice board. There was a difference though, and there’s simply no way I can convey to you the emotional impact of those words-“battle order? I still feel the sudden, heart-stopping shock of seeing my name on the battle order for the first time, realising that battle” means that there are people out there that are going to do their best to kill me. This was implicit, of course, in everything I had done since 1941, when I signed up, but it was all in the future, theoretical until now. However, it was also unbelievably exciting, challenging. So for the first tim we went through a procedure that was to become familiar, monotonous almost. Briefing- target, approach, tactics, opposition to be encountered, formation makeup etc- into the truck for the drive out to dispersal, engine start and run up, taxi out to the end of the runway and get lined up, waiting for clearance from the tower, then airborne and into formation. In point of fact, there was a good deal more to it than that, but this is not a manual of operational flying. But it was very thrilliing the first time, and for quite a while thereafter – taxiing up to take off, giving thumbs up to ground crews as we roared past in our cramped, reverberating metal coffins. We lined up in two rows, one at each side of the runway, and started our run at 15 seconds intervals. The object was to get into formation as quickly as possible. We flew in “Vics” of 3, 2 Vics to a flight, and 3 flights or more to a squadron. 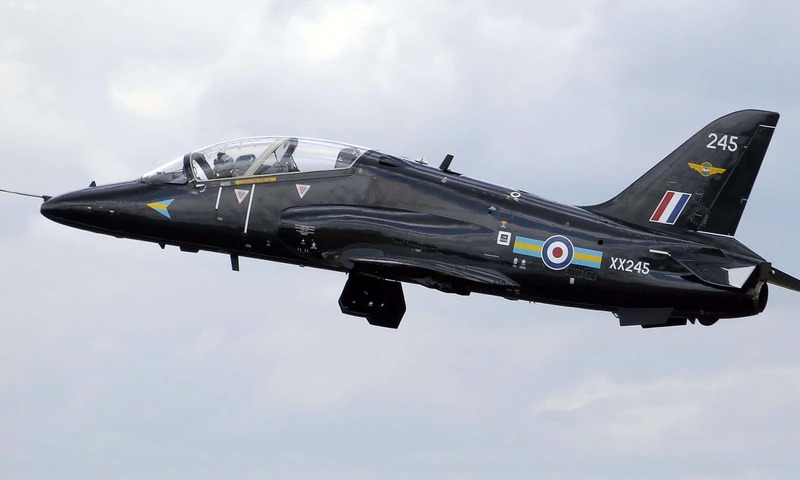 So from Dunsfold we’d field 54 or more aircraft, and getting formed up into a tight group in a short interval was a hectic job, and the last plane in each flight had to do some tight turning to take up position. And that was how one of my best friends, Jeff Davis and his crew died as they got into a steep climbing turn that must have stalled the plane and flipped them into a dive at low altitude, so they crashed in a field, not far from the end of the runway. Jeff, by the way, was married to a lovely woman, Irene, who lived with her parents in Greenwich. I attended Jeff’s funeral as the RAF represen- tative, and helped stop Irene from jumping into his grave. Months later I visited Irene- she had taken refuge in spiritualism, and she saw Jeff wherever shw went. She spoke to him while I was there, and he told her to let me have his briefcase. I used it for years. Anyway, we’d cross the English coast and out over the Channel, and there for the first time, was the enemy coast. It was quite a moment, that first sortie. We’d start evasive action at once, and duck and weave our way out to the target and back again, in the hope of making it as tough as possible for the flak crews, who were very good at their work. The Germans would broadcast on our wavebands all kinds of interference- fake bombing instructions, static, howling, screeching sound tracks that were distracting and disturbing. It was hard to concentrate with all that going on. But finally the target would come into range and we’d turn on and line up on the bombing run. You could follow the bombs along their trajectory for quite a way, and then they’d be exploding in the centre of the concussion rings rippling out in great clusters. And I have to tell you that I experienced a great exultation as I saw those first explosions. Today I would to God I had never been part of it, but then it was the culmination of all my work to that end, it was a blow in return for all that happened to my family and my friends in the Blitz. My only consolation is that we attacked only military targets. I’ve had trouble enough living with that, but it would have been hard indeed to have been in Bomber Command and to have destroyed civilian targets. Particularly since I knew at first hand what suffering was involved in attacks on civilian towns. My first experience of flak was curious. Suddenly there were clusters of black balls all around us, and for a moment I stared blankly at them. Then it hit me- there were people shooting at me- at me! What had I done? There was no fear, but anger, curiosity. I was too dumb to be fearful on that occasion. Fear would come a bit later, as experience grew. When flak bursts very close, the aircraft rocks. At those times, chunks of shrapnel will hole wings or fuselage, usually without real damage. I was once given a piece of perspex that was hit by an almost spent shrapnel fragment, taken out of the window alongside my head as a souveniryby the rigger that replaced the damaged section. It was softened and quite plastic- your mother had it for some time before it was discarded. So long as flak bursts are black, without the angry red centre that indicates they are getting very close they are not immediately menacing, but it is still uncomfortable to be in the midst of those ominous, sprouting black puffs that materialise soundlessly all around you. And sometimes there’d be an aircraft hit, wing crumpled, tail shot off, engine hit, and we’d watch for a moment, wish the crew luck, and get back to our own concerns of staying alive. Even today as I watch movies or newsreels of those days, and see aircraft going down, my heart turns over as I think of the horror of the men in those planes, seared by fire, held in the iron bands of multi-gravity forces, knowing they are dead men. 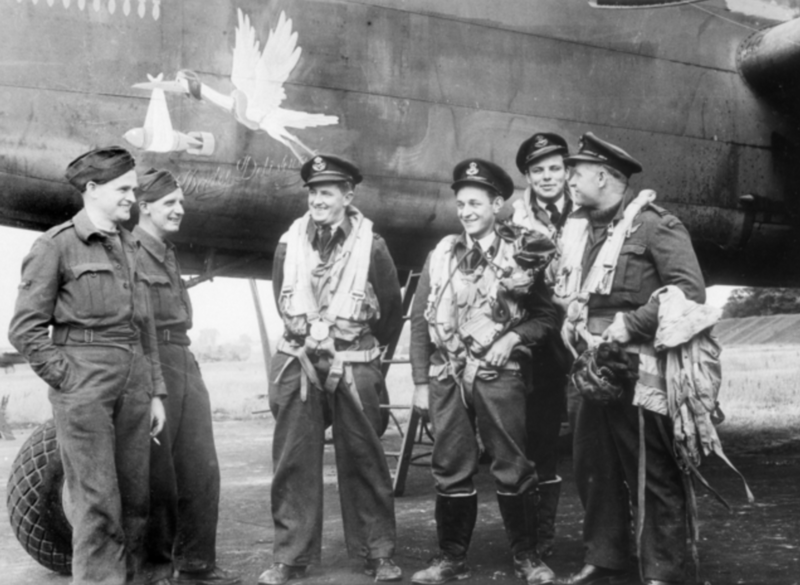 In the TAF our casualty rate was high, but not as high in Bomber Command in 1943. But losses are relative. For Irene Noble Davis a loss rate of 1% would have been the same tragedy as it actually was for her, had that one out of a hundred been her Jeff. At night , it was strangely beautiful. There were searchlights, tracer shells that seemed to climb up towards you slowly, gracefully, then suddenly hurtle past at incredible speed. A curious feeling to be watching the shell that may finish you, a shell aimed at you personally. You could see the gun flashes on the ground below, bomb bursts, fires,- earth and sky were filled with a brilliant, deadly light. The engines on our plane glowed a dull red, with blue flames flickering from the exhaust ports. Inside the cabin , subdued instrument lights, radar navigation with its ghostly green screen, bomb switches and indicators glowing red. And overhead, serene and remote)were the moon and stars, but we were too busy to heed the contrast between the that indifferent serenity and the frenetic fury we were engaged in. Only now can I put it into perspective. Another word on forming up. Often we had to take off when the field was completely overcast. That meant climbing through cloud, sometimes of consid- erable depth, so there’d be a string of aircraft flying blind, at 15 second intervals, making at least one turn onto a prearranged heading so we’d be lining up on our course for Littlehampton, which was our exit point from England. Consequently there was an air of heightened awareness as we kept lookout for all of the other aircraf that were thundering up on our tail, and those ahead that we were closing on. It wasn’t a precisely intervalled process ion, you understand, since quite small variations in airspeed and rate of climb would eat up 15 seconds of space and much more in transit through deep cloud. So when finally we did emerge through the top of the layer, there was first a rapid scrutiny of the immediate area as aircraft surfaced one by one, like a string of porpoises in line astern. Next matter was to locate the squadron leader, and make for him at full throttle. The identification was by means of coloured Very signal lights- each squadron had its own assigned colour, so you searched the sky for the green light or whatever was your squadron’s colour for that mission. Despite the confusion, we always managed. Remarkable, really, that so young, and with such brief training, we were so proficient. But then, we had two incentives. Your life depended on it, and almost as important, you could not afford to be perceived as lacking in skill or courage. Back to our day off. We’d get on our bicycles and go for a long ride around the Surrey countryside, ending with a beer at the local pub. (My bike was my trusty old Raleigh that I had bought with money saved from my first job. It had cost £3.10.00, and was still in perfect condition when I left it in England in 1948.). We’d be wearing battledress, with the obligatory white sweater or silk scarf which would indicate that we were operational aircrew, not the shiny arsed brigade. But that was all the bragging we engaged in. I think we were very modest about our role, but then, at that time, so many men were in combat- much of it far worse than ours- that there was nothing remark- able about it. Except to one’s own self. Then it mattered very much that you were somebody’s target, and as the number of missions you flew increased, so the odds against you lengthened, and the moment came when, by simple arith- metic, you knew that you were living on borrowed time. The first few trips were easy, and although you could see crew names erased from the squadron roster as they’d get the chop, you gave little thought to being included in the Grim Reaper’s toll. (we joked a lot about the “Grim Reaper”. In the RAF’s magazine published for aircrew, a cartoon showed him finishing off a pass with his scythe, and an airman with a thin line around his neck, ducking and saying “missed me”, to which the G.R. replies, “just don’t shake your head, sonny”). However, as time went by, we became much more sober, much more aware that we were crawling out further on a rather shaky limb. we were still high spirited young men, but now it was a relief to land safely, and chalk up one more mission towards retirement. We had a set of rituals before take off as good luck talismans. 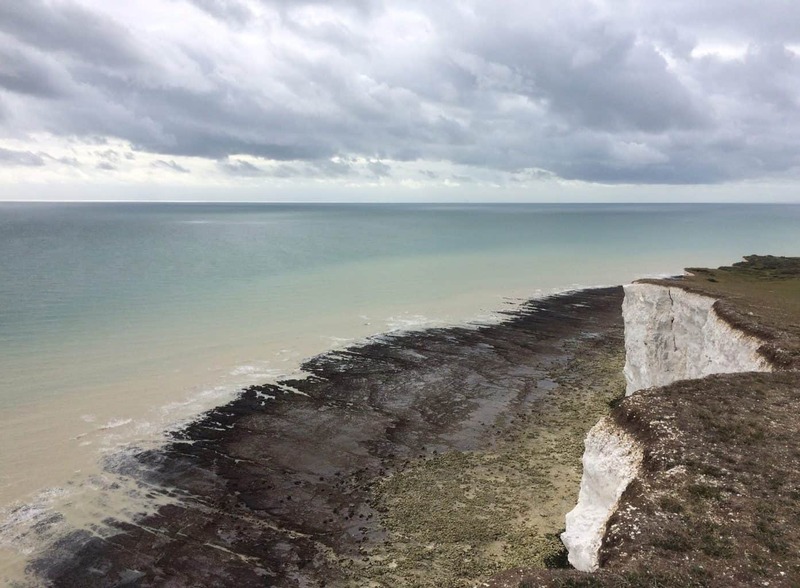 And once airborne, I had one all-important act- crossingfthe English coast on the way out, I had to be able to see some sign of life below- a car, smoke from a chimney, a cow~ anything moving, living. That was taken as an omen that I’d be returning. Curiously, on the occasion we did not come back, I had looked in vain for my sign, and I knew then that.we’d had it. A few days previously I had seen a movie about the Spanish Civil war, “For whom the bell tolls“, and as I left the theatre I suddenly, overwhelmingly realised that my number was up. So it.was written, and as we flew on to France that day, I knew it was all over. 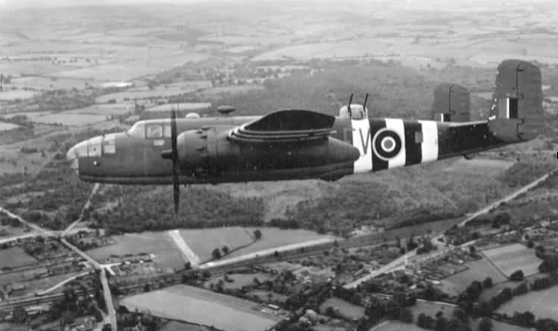 We were very busy around D-Day, and we often flew two missions a day. Each took about 4-5 hours, with briefing, the flight usually of 3 hours duration, and de-briefing. So we’d be woken at first light and get an early start. After each mission, we were served bacon and eggs, which at that time was a luxury that few in England enjoyed. we’d look forward to that, eaten in casually wolfish fashion in the mess tent, usually with shared knives and forks, for there were never enough to go around. Then we could lounge around the briefing hut, waiting for the next flap, or going over to the Naafi van in the disperse area for a cup of anaemic tea. We were given “combat rations” of raisins, oranges and chocolate, which again, in England was a rare privilege. Finally, we’d be called in for a new briefing, and we’d start the same routine once more. Out to the aircraft in the truck, which would drop off each crew at its own aircraft. Ours was “D”, with the squadron letters VE. The plane was decorated with a stork carrying a bomb in a sling, and titled “Daily delivery‘ The ground crew would be finishing the bomb loading, ammunition, fuel, and we’d don our parachutes, escape kit, revolver, knife, helmet and intercom, Mae west, etc. we’d be dressed in battledress uniform, flying boots, sweater, and would be carrying maps, charts, and all the other navigational parapher- nalia. Then into the plane, engines started and run up, taxi out and take off. After we’d flown 25 missions, we were considered an experienced crew, and we usually carried a fifth crewman with us on familiarisation flights- supernumary crew. One I remember well- George Gabay from Jamaica, for he stayed with us for several missions. His family back in Montego Bay used to send him Guava jelly and such, and some very potent rum. So we would have a crew picnic from time to time, with George’s tropical stuff, canned lamb from New Zealand, and a saffron cake baked by your maternal grandmother. Mitchell II, EV-T (likely to be HD316,) of 180 Squadron. Photo taken above Hook in Hampshire. Our last operational flight took place in late August 1944. (August 25th 1944 in HD316) We took a flak burst in the port engine and it did other damage, the most serious of which was jammed bomb doors. That meant, of course, that we couldn’t jettison the bombs, and with that 2 tons dead weight plus one engine out, and the other dubious, it was evident that we’d have to ditch, and the impact would probably break the back of the plane if we landed heavily, so we sent out a Mayday and prepared to ditch. It was a sunny day, but a moderate sea running, and we lined up with the swell, but we hit very hard. Rad and I were both pretty well braced, but we were both flung forward on our respective control columns. After that, things are confused, and I have no clear recollection of the actual sequence of events. I must have been able to release the straps and get out through the escape hatch over our head, for I next remember being in the water with Rad and Ken. Ken was terribly injured, in great pain, and he was calling out “for Christ’s sake, help me mates”, but of course, there was nothing we could do, he could not even hear our voices, trying to speak with him, and in time he died. Harry Walters and our supernumary gunner, a Yorkshireman whose name I cannot recall (Sgt. 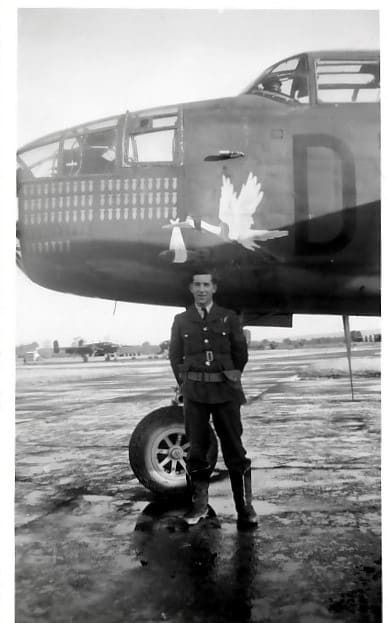 Lawrence O’Brien RAF who had been reallocated an aircraft a month after a raid on Caen where his pilot and navigator were injured by flak and the co-pilot killed) ) went down with the plane, which must have sunk very quickly. 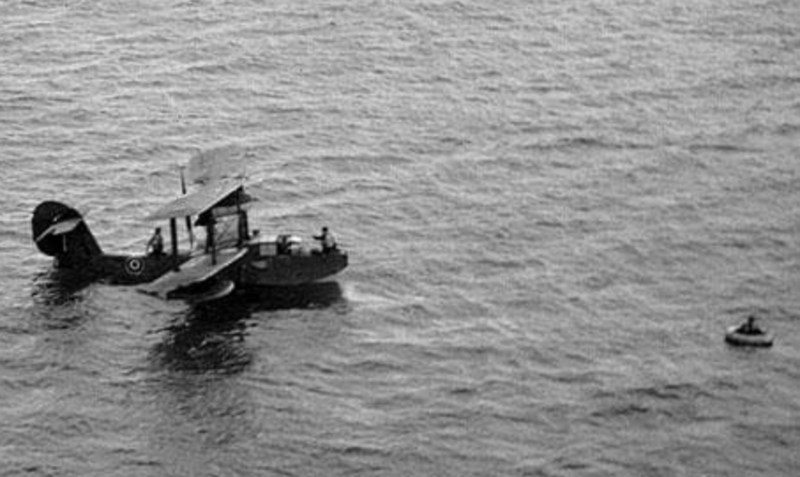 I was in the water for several hours before we were located, because our Mayday was not clearly received or plotted. I seemed to drift in and out of consciousness, because I do remember singing Jimmy Durante’s song “Send for my friend Umbriago”, and I recall bobbing up and down among a few hits of wreckage from the plane, and the bodies of Rad and Ken. Rad had also died, from injuries and also perhaps from shock and immersion in the bitterly cold Channel water, despite it being August. I can still see in my mind’s eye the small circular horizon with waves rising and falling within it, and me in the centre. I do not remember being fished out by the crew of an amphibious plane that found us. Anyway, I was taken to a hospital in Shoreham (Southlands), and had my head sewn up, and I was OK except for concussion and exposure. 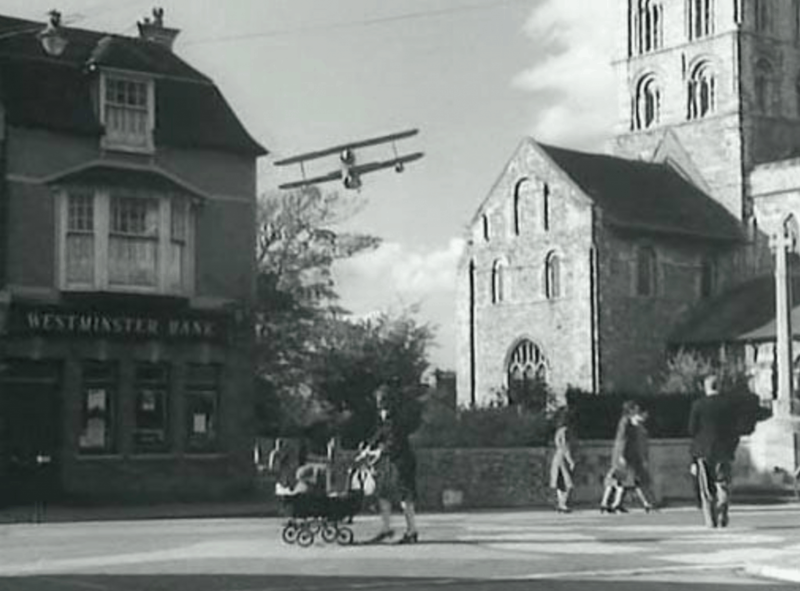 A week later I discharged myself and returned by train to Dunsfold, in sea-stained flying outfit and a double row of stitch holes in my forehead and scalp. So my crew are split up- two buried in England, two at the bottom of the Channel still inside the plane. And like Ishmael in the Bible, I alone am returned to tell thee. I’ve wondered ever since, why me?, why me only? They were all such good men, and their loss and my survival has tormented me all my life. We were very close to the end of our tour of combat duty when we bought it, so it was decided that it was impractical to incorporate me into a new crew for so few missions, so I was sent to Nairn for review and assignment. 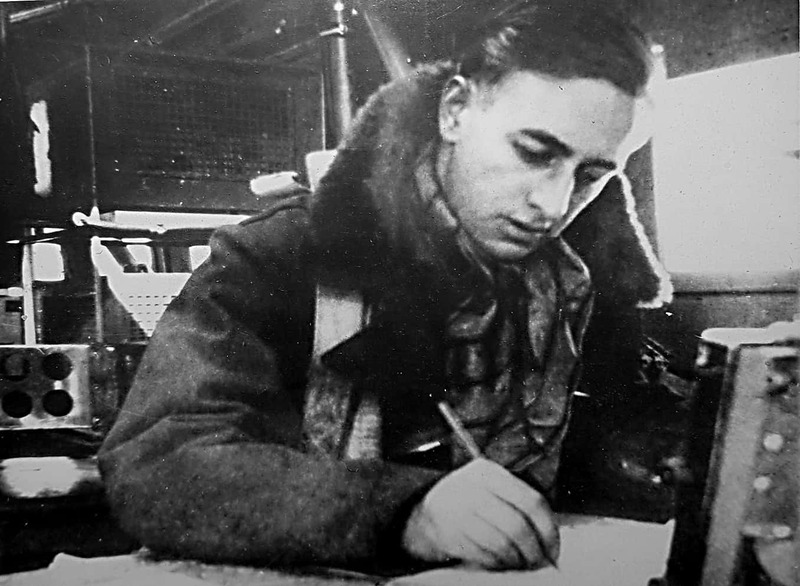 They found that physically and mentally I was fit for flying duty, and after extensive and quite interesting educational testing, I was deemed up to specialist navigator training, so I was posted to Central Navigation school at Shrewsbury, and did some exacting and engrossing work there. By this time, it was evident that the war in Europe was won, just matter of when the surrender by Germany would end it, so one project the school was working on was post~war commercial flying over the Pole. 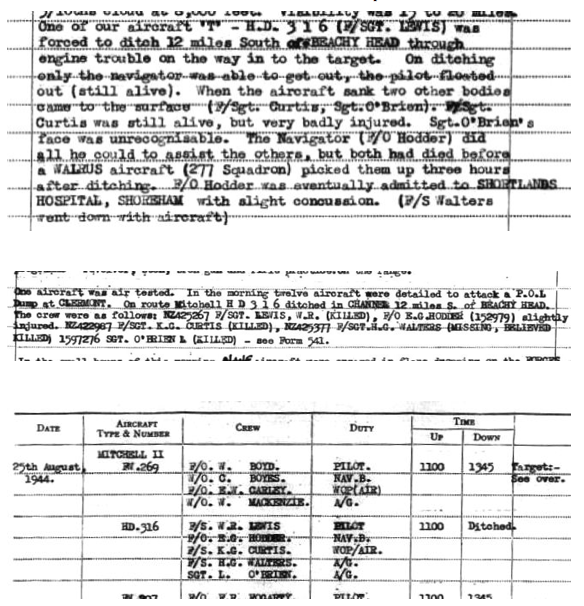 Thanks to F/O Hodder’s family for providing the typed memoir from which we transcribed the above story, and to Frank Phillipson for the extensive research and analysis of the 180 squadron ORBs. “Daily Delivery” did come up in the researches: these two photographs show her and her final fate.